There’s general human capital, which is useful at many firms, and firm-specific human capital, which is only useful at one firm. If your workers have firm-specific human capital, and you lose them, and need to hire new workers when demand returns, it will be costly to train the new workers for the particular skills they will need in your firm. So you won’t want to lose your existing workers, and you will keep them on the payroll even if you don’t need them right now. But if your workers have general human capital, it doesn’t matter if you lose them. 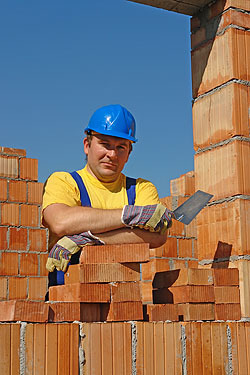 You can lay off all your bricklayers in a recession, and just hire new bricklayers when demand returns. My guess is that the construction trades require a lot of general human capital and very little firm-specific human capital. Two building sites can swap bricklayers easily, with minimal re-training. “Welcome to your new job. The Porta-Potty is over there. Start laying bricks here”. Am I right? Let’s combine these two observations. In the postwar period, I don’t think it’s quite right to say that recessions were deliberately inflicted by the Fed. Rather, they were largely inflicted by the automatic operation of Regulation Q, which imposed caps on the interest rate that banks and S&Ls could pay on deposits. When economic expansions got a little too robust, and inflationary pressures pushed market rates on treasury bills and corporate debt above Regulation Q ceilings, depositors would withdraw their funds from banks and invest them elsewhere. This loss of deposits caused an immediate shutdown in the mortgage market, which in turn caused an immediate turndown in the construction market. This cooled down the economy, and eventually market rates declined and money flowed back into banks. Next stop: recovery. So what’s the difference between then and now? The construction sector is crucial to both eras, but the difference is that Regulation Q was so effective: it shut down the credit market at the first sign of irrational exuberance, but it also eased up at the first sign of recession. Everyone knew this, which I imagine gave firms a certain amount of confidence that postwar downturns would be sharp but short. Our current downturn offers no similar assurance. The credit market got far, far out of hand before the 2008 crisis cut it off at its knees, and there’s no longer anyone or anything that can wave a magic wand and bring the construction industry back to life. And once again, everyone knows this. Back in 2008 there was no reason to think that the construction industry was going to recover soon, and no reason to think it would fuel a more general recovery even if it did. So firms hunkered down for a long downturn and laid off as many workers as they could. All of which is a long way of saying that I’m not sure construction holds the key to anything this time around. There was a huge collapse of credit throughout the economy in 2008, and every sector is now engaged in a long, slow process of deleveraging. Given the uncertainty surrounding this mechanism of recovery, it strikes me as unsurprising that firms are reluctant to rehire.